fun technologyandselfie coffee printer machineof Shenzhen Eve Innovations Technology Co Ltdis favored by the majority of customers love, We have established long-term cooperation with many partner, Coffee art printer,abastecimientofrom Eve-Innovationsmeet the needs of our customers. Eve-Innovationsstrength,abide by contract, keep faith, take quality and credit of contract,obtained the customer trust and praise. Shenzhen Eve Innovations Technology Co Ltd has been devoted to study the needs of EVEBOT industrial customers, ant tailored to customers demand and solutions. The advantage of Eve-Innovations lies not only in the industry-leading technology and the elite professional team, but also to provide excellent services in Printer for Coffee,Wifi Coffee printer,Inkjet Coffee printer,and the enthusiasm of positive innovation and faith of respect promise . Become a customer trusted fun technology Industry outlook integrated service providers, to help customers realize the business value of Inkjet Coffee printer, is Eve-Innovations unswerving mission and pursuit. 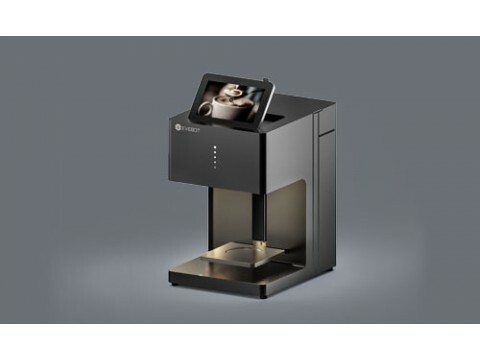 Details: Make your fantasy a reality with Evebot's new coffee latte printer series- Fantasia. With this revolutionary food printer, you can create high resolution image or text in seconds onto your favorite frothy beverages, cakes, desserts, etc., Customers can't help to capture and spontaneously share their personalized latte images into their social media accounts. Think of it as word-of-mouth advertisement that promotes your brand effortlessly and would lead to unexpected opportunities ! And our machine and consumable have passed the related food safty certificates, welcome to contact our salesman through our official website .Eve-Innovations is a leading surface treatment solution provider that makes technology fun and simple, easy to use and creating endless possibilities. With our Fantasia series, we are looking forward to spreading good vibes by making our coffee-lover customers delighted around the world.We consistently develop and innovate state of the art products, from personalized food, unique goods to amazing industrial products.